The Town of Hadley is located on the northeast corner of Saratoga County at the confluence of the Sacandaga and Hudson Rivers. Hadley is entirely in the Adirondack Park and offers many recreational opportunities for the outdoor enthusiast. You can ride the rapids on the Sacandaga River, hike Hadley Mountain to the Hadley Fire Tower built in 1917, float down the peaceful Hudson River, play a quick nine holes at the local golf course or just enjoy our small town atmosphere at a mom and pop type businesses that Hadley has to offer. A scenic train is expanding from Corinth to North Creek with a stop in Hadley as well as other destinations along the rail. 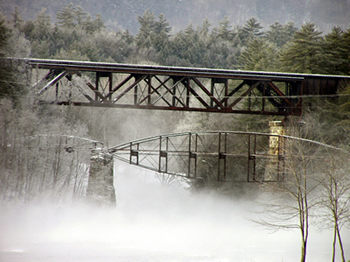 Hadley is also home to the historic Bow String Bridge over the Sacandaga River. The bridge has been on the National Historic Register since 1977 and has recently been restored and reopened by Saratoga County.